The answers reflect a mix of positive and negative news. Thousands of committed people in the government and private sectors are accomplishing a great deal of excellent work that is leading to significant improvements in certain areas. Yet the Sound continues to show troubling evidence of decline. Most notably, the health of the Sound’s living resources—orca, rockfish, marine birds, and others—appear to be in jeopardy. Their plight may be the signal of a broader systemic problem. The goal of a healthy Puget Sound now and for future generations can be achieved, but to achieve it will require redoubling efforts and expanding the scale of work. To be successful, new problems must be prevented from being created, activities to protect and restore must be scaled up, a broader constituency in conservation and restoration efforts must be engaged, and the overall investment in this work must be significantly increased. 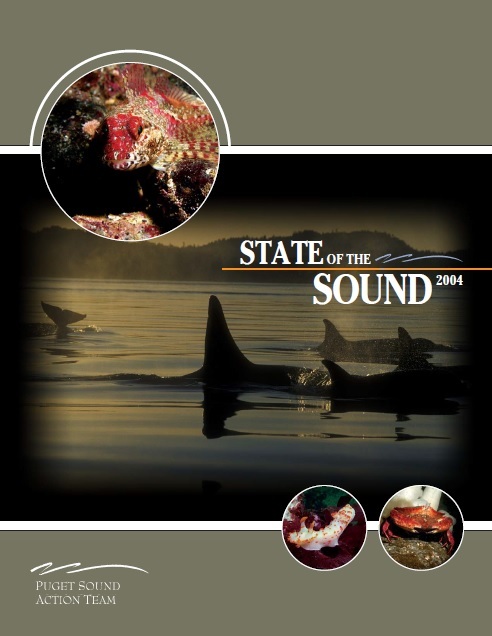 State of the Sound 2004 reports on the health of Puget Sound, focusing on 15 environmental indicators that provide insight into the condition of the Sound’s water and submerged lands, habitats, and species, and the threats to these resources. State of the Sound 2004 also reports on the progress of the Puget Sound Action Team partnership (Action Team partnership) to improve Puget Sound’s health in 2003 and 2004. The Action Team partnership defines, coordinates, and implements Washington State’s environmental agenda for Puget Sound. Since the partnership credits much of the progress in the Sound to the actions of federal, local, and tribal governments, organizations, businesses, and citizens, this report includes examples of their work.